Over 40 years before Blackberry introduced its PlayBook tablet, Kenner Products rolled out a decidedly lower-tech (but more popular, I suspect) version of a playbook as part of its educational toy, My Books That Talk and Record Player. Instead of an operating system and apps, Kenner’s version of the playbook consisted of an illustrated storybook (16-pages in length) combined with a vinyl 45-rpm record attached to the back cover. A specially designed record player completed the setup. Operating on a single “D” battery, the player does double-duty by holding both the book and playing the record at the same time. Unlike a traditional phonograph, the My Books That Talk turntable doesn’t include a tone arm with an attached needle. Instead, a sapphire needle is embedded into the toy itself – a kid-friendly design that helps protect the toy from damage and the records from being scratched through repeated use. When a playbook is placed on top of the player, depressing the “Talk” button activates the record and allows the entire contents of the page to be read out loud. The record pauses automatically at the end of each page and provides instructions on how to continue to the next page. In addition to reading the story word for word, each record also includes music and sound effects to add dramatic flair to the reading. Promoted as a “Fun! 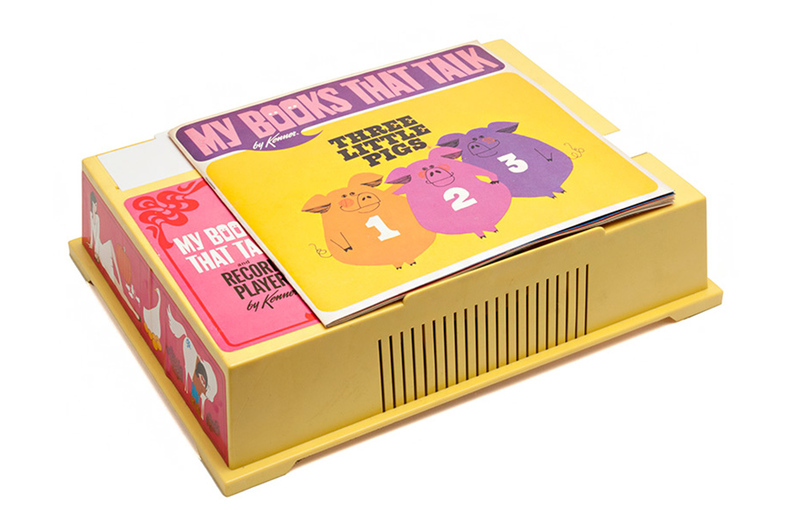 Educational!” toy that would help children learn to read, My Books That Talk and Record Player was released by Kenner in 1968 for ages 4-7 at a retail price of $9.99. The package included two playbooks – Chicken Little and Three Little Pigs – and a special adapter that allowed other 45-rpm records to be played. Kenner also released a refill pack that included four additional stories: Jack and the Beanstalk, Bobby and the Beach Umbrella, Cinderella, and Feather, Breeze and Tessa. Tom Berges, founder of igrewupstarwars.com, shares his top vintage Star Wars merchandise picks for the upcoming holiday season. In 1971, Mattel released Instant Replay Record Player, offering sports fans a new way to re-live the “agony and ecstasy” of famous play-by-play moments in sports.